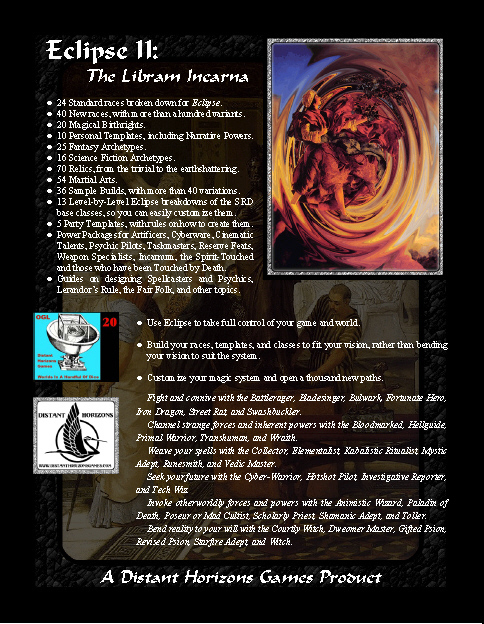 Here we have a product announcement: Eclipse II: The Libram Incarna is just about finished, and will be going up sometime in the next few days. 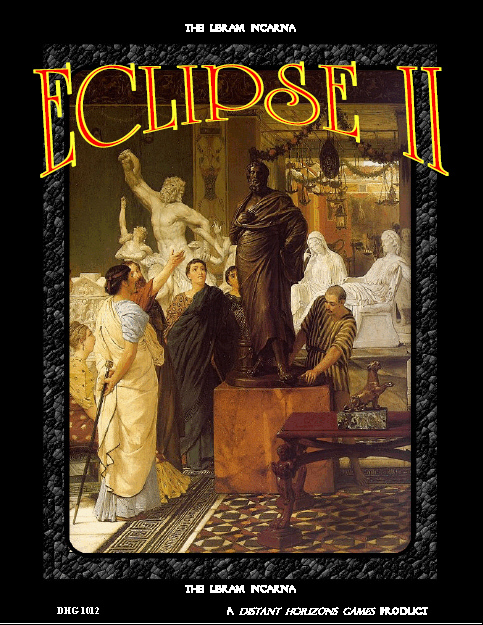 Eclipse III: The High Canon should be following in the next month or so. Both of them will be about 250 pages, and will be free supplements with the paid version of Eclipse: The Codex Persona or available independently for 4.99$ each. 24 Standard races broken down for Eclipse. 40 New races, with more than a hundred variants. 10 Personal Templates, including Narrative Powers. 70 Relics, from the trivial to the earthshattering. 36 Sample Builds, with more than 40 variations. 13 Level-by-Level Eclipse breakdowns of the SRD base classes, so you can easily customize them. 5 Party Templates, with rules on how to create them. Power Packages for Artificers, Cyberware, Cinematic Talents, Psychic Pilots, Taskmasters, Reserve Feats, Weapon Specialists, Incarnum, the Spirit-Touched and those who have been Touched by Death. Guides on designing Spellcasters and Psychics, Lerandor’s Rule, the Fair Folk, and other topics. Considering a delay of over two years, are you still working on Eclipse III? If not, it would be nice to know. If yes, what is then the current schedule? The original delay started with a computer failure – but the real problem is that Distant Horizons Games never really did make a profit. Thus I was eventually forced to shift DHG projects from “work time” to “hobby time” – which they’re sharing with articles, support for existing books, and actual gaming – and preparing a book takes up a big hunk of time. If there’s some real interest I’ll try to give it a regular place in the “things to be done” list and get it back to making regular progress though. It is a pity to leave it hanging. Oops, forgot to reply here. :) I would certainly buy a paperback one. But I’m not how big the interest is. Though it is doubtful, that you will solicit many answers on this buried page I managed to find only by chance myself. Sadly, Eclipse seems to be more options and complexity than most gamers want to deal with up front. I’ve had very good reactions from most of the people who have actually tried it – but a lot of casual browsers seem to find the density of the book and the general lack of fluff intimidating. Once they’re playing they usually seem to enjoy having everything they need in one book – but that usually calls for a GM who’s already playing with Eclipse. “Standard” d20 and Pathfinder are worse of course – but that sneaks up on people over the course of buying twenty or thirty books, rather than handing them everything at once and saying “Build your own!”. Ah well. I’ll try to fit it back into the schedule anyway.